Cockroaches being nocturnal make them difficult to detect early in the stages of an infestation. They only come out when you’re dead asleep, so by the time you see one you already have a serious problem. Is there nothing you can do about this then? Well you can stay up all night in the dark and wait to flip the light switch. Or you can do it the easy way and lay down some cockroach traps to catch them while you get some sleep. Most of the items required for these can already be found in your home. If you don’t conveniently have them already, it won’t cost you more than a few bucks to make a few of them. Before we get to the how-tos, let’s cover one thing that’s critical to making these traps work, placement. Where you place these traps is just as equally important as setting them up right. Set them where there’s likely going to be roaches, or where they will likely come through to scavenge for food and water. We just seem to never run out of uses for duct tape do we? Yes, you can use duct tape to help fix pest problems too (at least for small insect pests anyways). Duct tape works just fine, but I find it to be too much work, and the adhesive doesn’t seem to last as long. I actually prefer these Trapper Monitor traps instead. I only have to put them out about once a month–which is a major time saver. Cut a piece of duct tape to your desired length. You can make it as long as the whole roll, but I recommend keeping it to the length of your hands for easier management. Making one the length of a wall does seem like it would greatly improve your success rate though doesn’t it. Face the tape sticky side up. Fold both ends of the tape in, so you have about half an inch of the non-sticky on both ends. This makes it easier to pick it up for disposal later. Now you can just lay the tape sticky side up where appropriate. A trap always works best if there’s bait though. Remember that roaches love sweets and fats, so just add a small amount of that in the center of the tape. Use something solid because any liquid will make the glue ineffective. Also be careful to use small amounts. Too much of it and they won’t have to walk through the glue–which defeats the whole purpose of this method. All of this sounds like a lot of work–and it is. If you want to cut back on some work, I’d recommend getting monitor traps like these. Tip: Try peanut butter with a little sugar sprinkled on top for a bait they won’t be able to resist. Add in a little boric acid to make sure any that escapes doesn’t make out for long. Ha! We knew we would have a use for those empty jars we secretly collect didn’t we (or is it just me)? Ok, I wouldn’t call mine a collection…I just have a couple cleaned and washed sitting in the kitchen cabinets. You know, for in case I ever needed to use one for something. Well now we can use them to catch and kill roaches. By kill, I don’t mean smash them with it. We’re going to use it to build a trap. Jar (glass preferably, but plastic will work as well). Mayo jars, pickle jars, etc. Make sure your jar is clean and dry. This step is optional, but you can choose to use tape (like painter’s tape) to cover the outside of the jar. This will help make it easier for the roaches to climb up to their death. Line the inside of the jar–especially the area where it curves in for the opening–with petroleum jelly. This will make the inside extremely slippery so the roaches that get in can’t climb out. 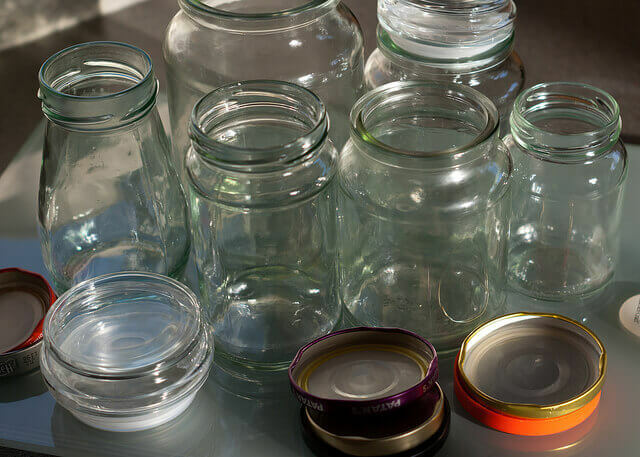 Place bait at the bottom of the jar and place the jar traps in areas where there’s likely going to be roaches or traffic. If you have pets or kids, keep these out of their sight and reach. Almost any food item that has a strong sweet, or oil smell will work great as bait. One other alternative bait that works well is beer. Pour just enough beer in there to drown the roaches. Another variation of the jar trap is to use wine and beer bottles. Instead of placing solid bait, you put a little amount of either red wine or beer at the bottom. For the wine bottles with a long neck, it may be difficult to apply petroleum jelly. You can try adding cooking oil into the bottle first and swishing it around until the inside is coated in oil. Then pour out any excess oil and carefully pour in the alcohol without touch the sides of the bottle. Jar traps are great and all, but they are just too big and bulky. It’s harder to find places for them too depending on the size of the jar. They’re also a lot of work. If you don’t want to deal with all that then the Trapper monitor traps are a great alternative. These traps work well, but you must remember that they are mainly to supplement a treatment. While they do kill individual roaches effectively, they cannot target the population as a whole. To get rid of an infestation, you need to apply other treatments such as Advion baits, or sprays like DemonWP that are capable of wiping them out (check out the section on how to get rid of cockroaches for some effective treatments). Not every single roach in your house will fall into your cockroach traps.